The current silver price trend is once again at a critical juncture. It has been four years since the price of silver crossed an important trend line. However, the present setup will result in either another correction lower, or a much higher price. The blue line represents the 50 month moving average, and the red line, the 200 month moving average. Since the price of silver fell below the blue line at the beginning of 2013, its support has been the red line. It did not fall below the red line at its low in the beginning of 2016 and has bounced twice off the blue line, which is now acting as resistance by traders. Currently, the silver price is hitting up against the 200 month moving average blue resistance line. If the silver price breaks above and closes above it, we could see a much higher silver price. However, if does not, then we could experience another short-term correction. 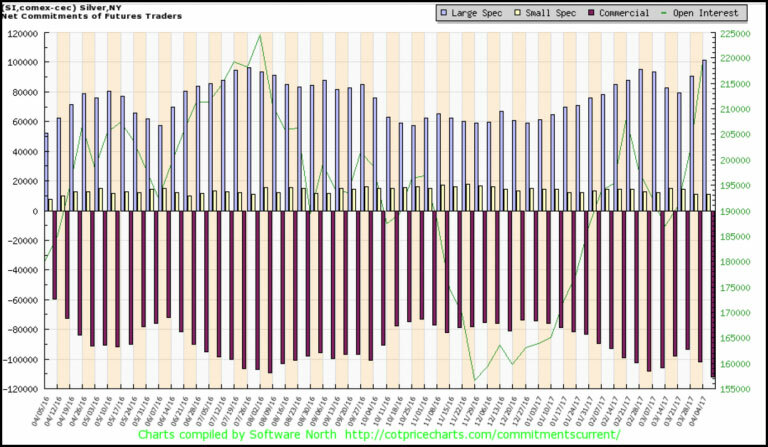 The red lines at the bottom of the chart represent the total Commercial net short positions in silver. As we can see, it is at a record high. This high Commercial net short silver position normally means the silver price will likely head lower... over the short term. That being said, I have become less concerned about the SHORT-TERM silver price movement. While some investors are able to trade and make money trading silver, I am not one of them. My focus on silver is to hold onto it for the LONGER-TERM. Short term silver price movements are not a concern when we focus on the disintegrating energy and economic fundamentals. Some precious metals investors have become frustrated or complacent due to the low silver price. This is understandable because some may have purchased silver at a higher price and feel as if they made the wrong investment decision. However, acquiring physical silver should be done over a period of time and be held as a SAFE HAVEN for the future... just like any other retirement plan. The BIG difference between owning physical silver and most paper retirement plans, is that the value of most retirement assets will most certainly plunge in value in the future while the value of silver will likely be much higher. Unfortunately, most investors are either too impatient, fickle or lack the ability to understand this LONG-TERM fundamental setup. Lastly, if Americans who are mainly invested in STOCKS, BONDS and REAL ESTATE, diversified into a small 2-5% allocation of physical gold and silver, it would totally overwhelm the market... forget about the rest of the 7 billion people in the world. Which is precisely why the MANIPULATION of gold and silver has been done mainly through psychology, rather than price. Why? Because the current algorithm pricing mechanism for gold and silver is based on their cost of production. So, to see a current $18 silver price and $1,275 is not that ridiculous if it is based upon what it cost to produce them. But, gold and silver behave much differently than most commodities, energy, goods and services. While most commodities and energy are consumed, a lot of gold and silver are saved. So, gold and silver must be valued differently. If individuals realized the dire energy predicament we are facing in the future, they would realize it would be prudent to own some physical gold and silver. However, they are being mislead by the Mainstream media, so they cannot really be blamed. When the markets finally crack... the Fed and Central Banks may have one last RABBIT to pull out of the hat, and that would be a HYPERINFLATIONARY event. Unfortunately, this will not last long and will end quite badly. Thus, when we reach this point... there is NO GOING BACK. The United States and world will look like a much different place and at that point, it will be too late to sell paper and buy gold and silver.